When people have cystic fibrosis, their lung will be infected by the disease. It is because of the sticky and thick mucus. 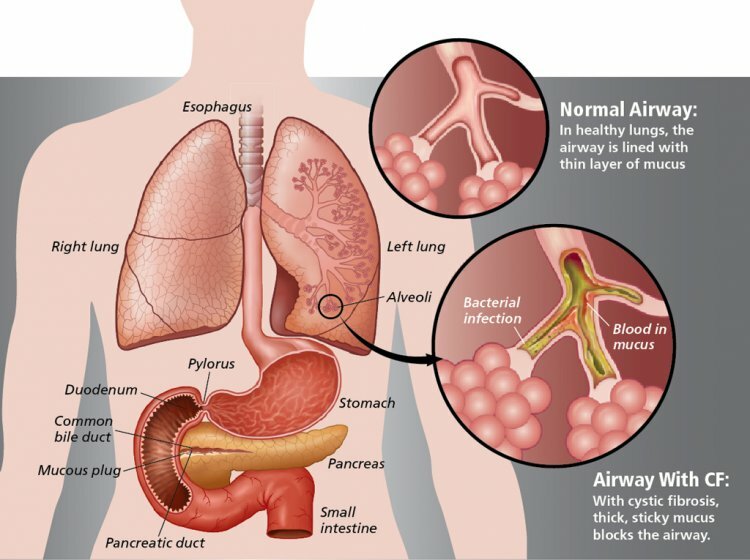 The airways in the respiratory system are blocked so that your lung cannot function well. People with CF will experience the serious lung infection. The people with CF usually develop it with they were kids. The lung function will start to destroy gradually since children. When the people with CF grow, they will face many severe breathing problems. CF not only affects lung, but also pancreas. The ducts and tubes on the pancreas are blocked because of the sticky and thick mucus. The protein and fat absorption cannot be done perfectly because the enzyme used in the intestines can be delivered from the pancreas. The people with CF will have salty sweat. When you sweat, you can lose a big amount of salt from the body. CF can lead to the imbalance of mineral in the body. You will face many health problems such as heat stroke, tiredness, heath rate, depressed blood pressures and weakness. In rare case, it can lead to death. CF is an inherited disease. It is because of the defect in CFTR gene. The children who have a faulty gene from their parents will have CF. If you only have one faulty gene of CFTR, it is okay because you are considered as CF carrier. You live normally, but you will give the faulty gene on your kids. The disease is considered as a common thing in Caucasians. There are 30,000 people with CF in America. Each year there are 1,000 diagnosed with CF. The symptoms of CF are different among people. Each person can develop different symptom. Each day, it gets severe. The bad news about CF is that the disease has no cure. You need to live with this CF the whole life. You need to have the right therapy and treatment to control the effect. You need to perform a good diet and healthy life style to slow down your CF. The expectancy of life for the people with CF is getting increased because people want to treat it well. The therapy and usage of medicines enable the people to live normally even though they need to struggle hard with the disease. What do you think on facts about cystic fibrosis?